Skiessa wrote: "but the people of the Middle East are, it seems, fair game." funny thing though, the facial features of the sphinx are sometimes thought to be more african than mid-east. but anyways I do believe in the water erosion hypothesis, and definetely don't think that mr. khafre did more than re-carved the head of the meow-meow at the best. here I am again, taking more stuff away from the brown skinned people. I could draw my cartouche on all of this white quilt. please call me racist more, i draw power from the liberal rhetorics hysteria. and that they were the ancestors of today's Egyptians. I do not know of recent modern studies of their mt DNA haplogroups. and the plateau also was not covered with sand then either. Thus the the Giza plateau had flash floods. but the Sphinx was visited by people for several thousand years. and the Sphinx was one of those places. and the formation of salt crystals would flake off rock from the walls of the enclosure. the central Egyptian archive, the House of Life, has not been located yet. And the Lower Kingdom's ties to the Mediterranean are not well known. The facial features of the sphinx wasn't an argument really, and it wouldn't affect the recarving-theory in any way. No bones have been found, but most of the giza plateau, as well as most of the northern africa, remains unexcavated. We simply don't know who have wandered through the giza plateau through the times, and as i've mentioned earlier, the further away we look, the less we can assume to find, due to the natural scattering of the organic material. We cannot assume all of the material to rest in the place they were originally left for 50,000 years. As geologists such as Robert Schoch and Randall Carlson have studied, the annual flooding wouldn't explain the erosion level and pattern of the sphinx surroundings. The pattern suggests that the erosion must have been caused by rainfall, and the level of it suggests that it must have took thousands of years of heavy annual rain to cause such erosion. Interesting facts are, that the erosion level is not visible on the head of the sphinx whereas the body of the sphinx has visible erosion marks in it in the parts that have not been repaired. The pyramids neither have erosion marks, although they could have had a now lost layer of casing stone, as even the mainstream archaeology has suggested at some point. I really recommend you to watch Randall Carlson's visits on Joe Rogan podcast. That guy is simply fantastic! 30 years of active research on geology and other fields of science. highly professional, very articulate and intelligent, with tons of scientific papers and diagrams to present in the podcasts. No off-topic babbling - 6 to 7 hours of straightforward scientific representation with Joe mostly playing the role of the interviewer. Workers had to pee - this was a joke, right? skiessa, you need to read more geological reports from other geologists. or any of the other North American drainages. I myself use the work of many other geologists. and that some of them work on impact tsunamis in the Atlantic Ocean. does not appear to be linked to the 10,850 BCE impact event. E.P. Grondine wrote: skiessa, you need to read more geological reports from other geologists. Yes, i'm aware that there are other scientists working on the same questions as Carlson, coming into different conclusions. But anything that i've stumbled across to haven't been very convincing, and has seemed more just a headline attack against Carlson's idea, hanging on some minor issue while completely ignoring 90% of the arguments, rather than an actual deep study on the topics dismissed. Some of the counter-arguments are almost weird though, making it seem like the person doesn't even believe that the ice age ice sheet ever melted. Do you have a study which scientificly dismisses the water erosion of the sphinx, for example? You do believe that the last ice age was ended by comet impacts? 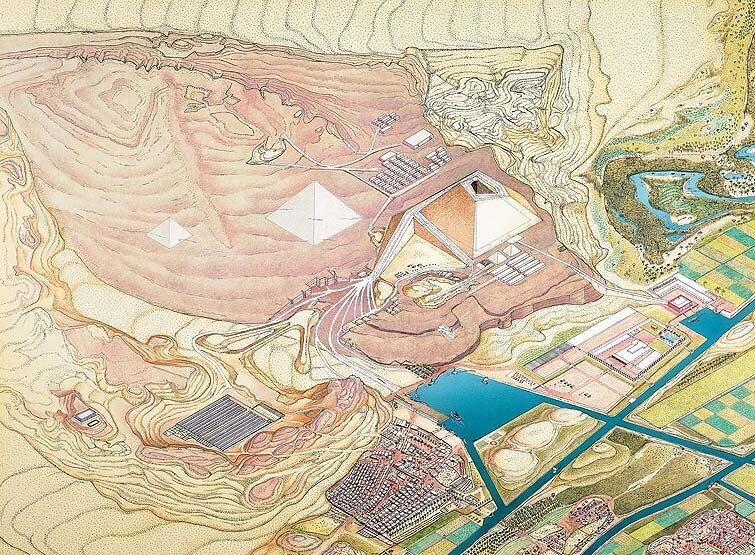 From Harvard, a digital website concerning the Giza Plateau & all structures built there. Skiessa will, of course, dismiss this entire website as a conspiracy of propaganda, lies & forgeries. Skiessa wrote: Yes, i'm aware that there are other scientists working on the same questions as Carlson, coming into different conclusions. But anything that i've stumbled across to haven't been very convincing, and has seemed more just a headline attack against Carlson's idea, hanging on some minor issue while completely ignoring 90% of the arguments, rather than an actual deep study on the topics dismissed. Some of the counter-arguments are almost weird though, making it seem like the person doesn't even believe that the ice age ice sheet ever melted. Do you have a study which scientificly dismisses the water erosion of the sphinx, for example? Carlson is very adequate at the Columbia River and Upper Mississippi River drainages. but since the recovery of Hibbens' field notes and images that skepticism has suddenly become very muted. there will be an impromptu session at the bar that will go on for some hours. The same thing goes for the Lunar and Planetary Institute annual meeting in Houston. and all the can be said is that the two comet impacts occurred during the end of the last glacial cycle. and your not likely to see used copies that cheap ever again. and are likely to return there and then go up significantly. I won't have time to see if what around for you, as my own work is now several weeks behind schedule. I do not know whether or not the site spice has directed you to has that one very good online study or not. circumspice wrote: From Harvard, a digital website concerning the Giza Plateau & all structures built there. Their 3D reconstruction does not show the port nor the workmens' quarters. It shows nothing of the Giza Plateau quarry. now all they have to do is cut that over to a 3D model and CGI. If they can't do that, Ancient Aliens wins the viewer graphics competition. Last edited by E.P. Grondine on Sat Mar 03, 2018 8:56 am, edited 2 times in total. Hmm, as long as there are no better arguments available, i'll stick with Carlson's and Schoch's, because they are very convincing. The erosion level is so immense that one most likely never witnesses anything alike anywhere else. It's actually very strange, even though the limestone is very soft in the rock hardiness scale. The implications of this are clear, even if we would never have stumbled into Göpekli Tepe. But i will look your work, thanks. I'm actually amazed of how very few seems to realize the implications of the sudden end of the last ice and the following sea level rise. Because if we just look the modern world map to see where we flourish the most, we'll see that almost every major city is located on the coast, and most likely less than 100 meters above the sea level. The reasons for this are clear: the sea provides us plenty of food, option for sea travelling and at the historical times, a great protection from the invading enemy. There is no obvious reason why exactly the same wouldn't have applied on every single civilization ever emerged, so most likely if there was an ancient high civilization, it also lived mostly along the coasts and low lands on river banks. What this means is that most likely if such civilization existed, it's ruins are now 100 meters under the sea. We are now living on their highlands, so even so that we cannot find a trace from them from here it doesn't imply that they didn't exist. We are looking from the wrong place - the future of the archaeology awaits under the sea. Which raises another question: what evidence exactly are we looking for? Metals can corrode away in 100 years, wood in just few decades, paper and papyri in just few years, buildings most likely fall down in several decades without maintenance, and their foundations are vulnerable to erosion and will slowly be destroyed or swallowed by the movement of the soil and once buried, even trees can grow on them. Looking for ruins, tools, weapons and documents is like looking for the snow from the last year to prove that the winters have occurred before the current one. The further we look, the less we can assume to find, and after certain period of time all that would be left are the huge stone monuments like the pyramids or world war 2 bunkers, and the stone weaponry and tools from the hunter-gatherer phase of the pre-civilization time. What also no-one seems to realize, is that as the stone tool finding will not indicate the average technological level of man in the certain time. many modern tribes still use stone weaponry, and also we do sometimes carve the stone weapons for our children and often teach them to do pottery. And as I have mentioned earlier - the more civilized we become, the more we take care of our waste and deceased, so we cannot assume to find organic matter from the construction date either. The absence of evidence seems to prove only that the time has passed. And here we are - all we have are the megaliths and some stone weaponry and pottery. If we cannot directly connect a certain monument to a civilization that otherwise was far more primitive we shouldn't carelessly make the connection with anything that we can find from the surrounding area. What shouldn't be ignored either is the eerie similarity of the monuments and the construction style on different continents. Most notably the pyramidal shape, and the jigsaw puzzle-stone walls which all around the world have been carved to the accuracy that we couldn't replicate it without some serious problems. another astounding similarity that can be found all around the world in the megalithic building. Hmm, Graham Hancock has never talked about the Nephilim. You might be confusing him to Erich Von Däniken or Nassim Haramein..? Hancock actually did a 2 episodes long short documentary series on the sunken cities, where one episode focuses on the Yonaguni and the other on the sunken cities, for example the ones found in the Indian coast. Not his best work and lefts one to feel that he could have done so much more with an ease, but anyways it's worth of watching. Anyways he is an experienced diver, and have dived just in Yonaguni alone for over 100 times. I looked on to his link, and it seemed to be another of those sites which has a nice detailed description about the ancient egyptians with next to no reference to the evidence. A nice story without any kind of evidence mentioned, like reading the bible. In a nutshell all it left me with was the question of how in the hell do they think they've figured all this out. While i'm aware that the egyptians did write and inscribe alot on their walls, i also know that the construction of the Giza plateau has never been documented to our knowledge. A notable mention is also that the site didn't even attempt to debunk the water erosion. Oh but Hancock is trying to write on Andrew Collins work at Gobekli Tepe and the Nephilim, without promoting Collins or his books. of the Holocene Start Impact Events flooding. and he could write it all up off the top of his head if he wanted to. but I think that Hancock may be unable to handle that. but I dobt if he'll look at flooded Lower Kingdom sites. I am looking for that old flooding/erosion paper for you. Last edited by E.P. Grondine on Sat Mar 03, 2018 9:37 am, edited 1 time in total. E.P. Grondine wrote: Oh but Hancock is trying to write on Andrew Collins work at Gobekli Tepe and the Nephilim, without promoting Collins or his books. I remember Hancock getting mad about Skeptic magazine misquoting his words on some other alternative theorists work, don't know if it's this one. I don't know this case, but Hancock isn't that kind of guy who rides on other peoples work. He often refers to them, but with quotation. You can see him being very careful with his words on every interview and speech, because as a man with whole mainstream archaeology on his tail someone is constantly trying to twist every single thing he says to discredit him. instead of looking at the many advanced earlier civilizations that disappeared. On the other hand,e Collins was a nice boy raised in a Christian environment who developed an interest in angels. If you google real hard, you can find discussions of the "salt" crystals. I'm aware of what originally took Hancock to the guest for the lost civilizations, and i personally find the search for the ark of the covenant feeling kind of mixed. while I don't believe that the material world is all what's here, the evidence for the ark is basically just the word of the ethiopian priests and strange skin deformations and damage on their eyes. But despite of the start of the road being pretty fringe, i do believe that he eventually stumbled on something very real on the lost civilizations. Hancock has said that he believes to the possibility of multiple lost civilizations, and that the civilization might have born and died several times in our past, but the reason he is looking for the one "mother civilization" is the astonishing similarities between the architecture and the flood myths all around the world. I'm not 100% with this with him either - While it's certainly possible, I don't feel it necessary that the high civilization(s) would ever have involved much in our history. What looks certain to me though is that there was a pre-flood high civilization(s) which for some mysterious reason felt necessary to build such massive monuments which are almost systematically aligned with the equinoxes and devote the earth precession. what is interesting though is the appearance of gods living amongst the humans in many ancient cultures. for example in egyptian and sumerian history, they both wrote their past kings to consist of both real known kings and gods, and wrote the gods once to be lived amongst them. similarly many south american native cultures believed the same, and so that the gods would once return to them over the seas. I must say that my source to this part of the ancient history is only Hancock and several other alternative historians, but I dare to believe them since if such stories would be fake they would be the top priority target of the debunkers, and yet they have never been attacked with this. anyhow if these indeed are true, we shouldn't ignore the fact that this could indeed have implications. if you tell both american and african kid to compose a song, the odds that they both come up with "Old MacDonald had a farm" are quite low. "If you google real hard, you can find discussions of the "salt" crystals." sorry, but i just don't find the idea of the egyptians systematically peeing the sphinx to it's condition convincing enough to look for it. The longer link of yours I will look. What looks certain to me though is that there was a pre-flood high civilization(s) which for some mysterious reason felt necessary to build such massive monuments which are almost systematically aligned with the equinoxes and devote the earth precession. What is the evidence for your belief ? could provide examples of the "pre-flood high civilization(s)" monuments that are " almost systematically aligned with the equinoxes " ? What does "devote the earth precession." " mean ? If you meant something to do with axial precession then could you provide examples ? Aside from that, the obsession with precession in theosophist cult archaeology goes back a long way. Then what does "denote the earth precession." mean ? or , what does "earth precession" mean ? The point was "If you meant something to do with axial precession then could you provide examples ?